Tingling or numbness in your hand or fingers (except your little finger). Conventional orthopedic medicine maintains the view that Carpal Tunnel Syndrome is largely a local event, occurring when the median nerve, which traverses down the arm (from the neck), is compressed in the carpal tunnel at the base of the palm. The carpal tunnel is a space between bones, tendons and a thick ligament surrounding the median nerve. The specialized chiropractic discipline of applied kinesiology (utilized extensively by Dr. Davis) brought to light new information that allows the trained practitioner to localize the point of origin of carpal tunnel syndrome, which very often is not a local event. Most of the time there is abnormal positioning of bones and muscles in the neck and shoulder that weakens nerve transmission to the hand and results in separation of the radius and ulna bones of the wrist. 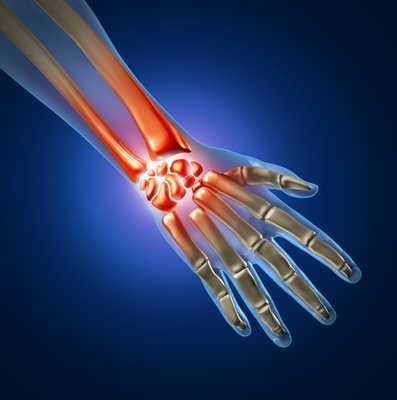 This causes a narrowing of the carpal tunnel and hence carpal tunnel syndrome arises. If this condition is treated correctly, it can often resolve surprisingly fast. Once muscle balancing is done, a specific chiropractic adjustment of wrist bones is often employed. Repositioning of the neck bones and balancing of the shoulder girdle is done initially. In longstanding cases a wrist brace may be needed for a short time. Proper nutritional supplementation to restore tone to ligaments is very often needed, and especially vitamin B6. In most cases (with the exception of severe trauma to the wrist), conditions that were thought to require anti-inflammatory drugs or to require surgery can be corrected with proper chiropractic care. If carpal tunnel problems are associated with physically stressing repetitive work tasks (such as heavy use of a keyboard in data entry), ergonomic adjustments will likely need to be made. Even though carpal tunnel is classed as a repetitive stress injury, the injury and weakness of the wrist area is, in most cases, actually secondary to the true cause of much more complex structural imbalance involving several areas of the body, and often involving nutritional deficiencies. Carpal tunnel syndrome is just another good example that reinforces the necessity of looking at the whole body (and not just local areas) when providing optimal health care.